Dr. Adam Rappel takes great pride in being a versatile percussionist. He has performed in Germany, Switzerland, Luxembourg, Austria and Sweden. He has also performed with YOA - Orchestra of the Americas - in Brazil, Argentina and Uruguay. In addition, he performed in the first International Percussion Ensemble festival in Costa Rica with the University of Minnesota Percussion Ensemble. As an orchestral percussionist, he performs regularly with the Minnesota Orchestra and has performed with the Saint Paul Chamber Orchestra, Mankato Symphony Orchestra, La Crosse Symphony Orchestra and the Central Wisconsin Symphony Orchestra. As a solo and chamber performer, Adam has shared stages with Valerie Dee Naranjo (“Saturday Night Live” percussionist), the late Kakrabe Lobi (African Gyil Master), The Paris Conservatory Saxophone Ensemble, the Renegade Ensemble, Eugene Rousseau, and Bobby McFerrin among others. He has performed and collaborated with international percussion luminaries such as Bob Becker (Canada), Eric Sammut (France), Pedro Carneiro (Portugal), Ivana Bilic (Croatia), Jeff Queen, John Wooton and Casey Cangelosi among others. Currently, Adam performs in “The Anacrusis Duo” with pianist Dr. Leah Siltberg, “The Dave Birrow Jazz Group” and “The Brass Barn Polka Band". In 2011, Adam co-founded Struck percussion ensemble, which is committed to performing new, genre-bridging music that exposes their audiences to fresh, interesting works for percussion. Struck has since collaborated and performed with the Minnesota Percussion Association, Rosemount High School, Winona High School, Metropolitan Library Service Agency’s “Live at the Library” series, Ballet Folklorico Mexico Azteca, MacPhail Center for Music and the Walker Art Center. Since their formation, Struck has commissioned composers to produce new music specifically for them and their audiences. Works premiered by Struck are “I’m Sorry, I’ve Already Forgotten Your Name” by Josh Clausen for percussion and electronics, “The Haunted House” by James Holdman for percussion accompaniment to the silent film “La Maison Ensorcelee” by Segundo de Chomon, and “Minneapolis Vignettes” by Troy Strand for percussion ensemble. 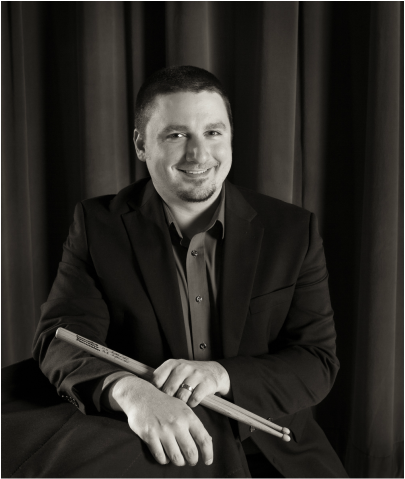 Adam is recognized for being a versatile percussionist as a performer and a teacher. One of his most important endeavors to the percussion field was being the administrative “right hand” for Professor Fernando Meza (University of Minnesota – Twin Cities) for the Marimba 2010 International Festival and Conference, an event that brought together over 50 of the world’s leading marimba artists in collaboration with the most important artistic organizations in the Twin Cities. This event reached over 10,000 people through performances in the most important venues in the area including Orchestra Hall, Ordway Theater, Ted Mann Concert Hall, the Walker Arts Center and the St. Paul Cathedral. In 2010, Dr. Rappel accepted the position of Director of Percussion Activities at Wayzata High School in Plymouth, MN. Since his appointment, he has established the percussion program into one of the most comprehensive and successful in the state. He spearheaded the acquisition of steel drums to form the “Wayzata High School Steel Band” and has taken their percussion ensemble to festivals including the Minnesota Percussion Association Days of Percussion and MacPhail Center for Music Percussion Showcase concerts. Students from this program have gone on to perform globally, and study at major colleges/universities around the world. Dr. Rappel has held teaching positions at the University of Wisconsin – Stevens Point, the University of Minnesota – Twin Cities, MacPhail Center for Music and Inver Hills Community College. He is currently serving as Visiting Assistant Professor of Percussion at Gustavus Adolphus College in St. Peter, MN. Adam received his Master’s degree from the University of Minnesota, studying with Peter Kogan, Phil Hey, Steve Yeager and Fernando Meza. He is the first percussionist to ever receive the Doctorate of Musical Arts degree from the University of Minnesota – Twin Cities. He is proudly endorsed by Innovative Percussion, and is a Yamaha Concert Percussion artist and clinician.